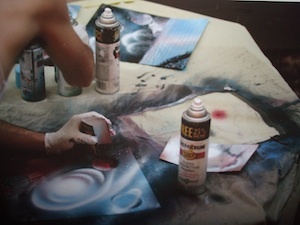 Welcome to Fantasy Spray Paint Art, where Mystical Worlds are Captured in Paint! All of our artwork is hand made with premium paint. We have gorgeous spray paintings for sale online ready to ship directly to you. Custom artwork can be made and shipped in less than ten days. If you would like to Purchase a Painting, you may browse the current paintings available. For custom work, use the Custom Painting Form. If you’re here just to see some wicked sweet art, visit the Gallery! My name is Marc Zirin and I’ve been painting with spray paint for a few years now. I paint all of these by hand and use belton Molotow Premium Spray Paint. The paint cans are low pressure for better detail control and work very well. Many years ago, I stumbled across Spray Paint Art online. 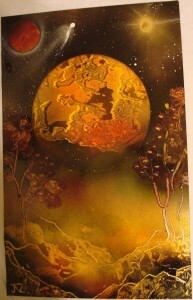 I was fascinated by how such amazing art can come from spray paint cans. I looked online for tutorial videos on how to paint them. To my surprise, there wasn’t a single video online; At least not any for free. I went to the store and bought the standard colors. After many trial and errors, I taught myself. At first I wasn’t very good, but after many paintings, my skills greatly improved. Now my paintings are something worth hanging up. All artwork on our Spray Paintings for Sale page is available for purchase. Fantasy Spray Paint has competitive prices and is the best place to buy spray paint art online. Check out our Holiday Promotions for great deals!! If your interested in purchasing a painting, please send me an Email or use the Contact form on this site, describing the painting you want so I can check to see if I still have it, and then we will email you for further details.